I’ve got a few pieces in this year’s Figurative Affair show. If you are in the Santa Cruz area this Friday, come direct your eyeballs at some fantastic work. I’ll be there 5-ish to 8-ish, come say HI. Ten of my paintings are up at EyeQ for the next couple of months. Go feast your eyeballs! 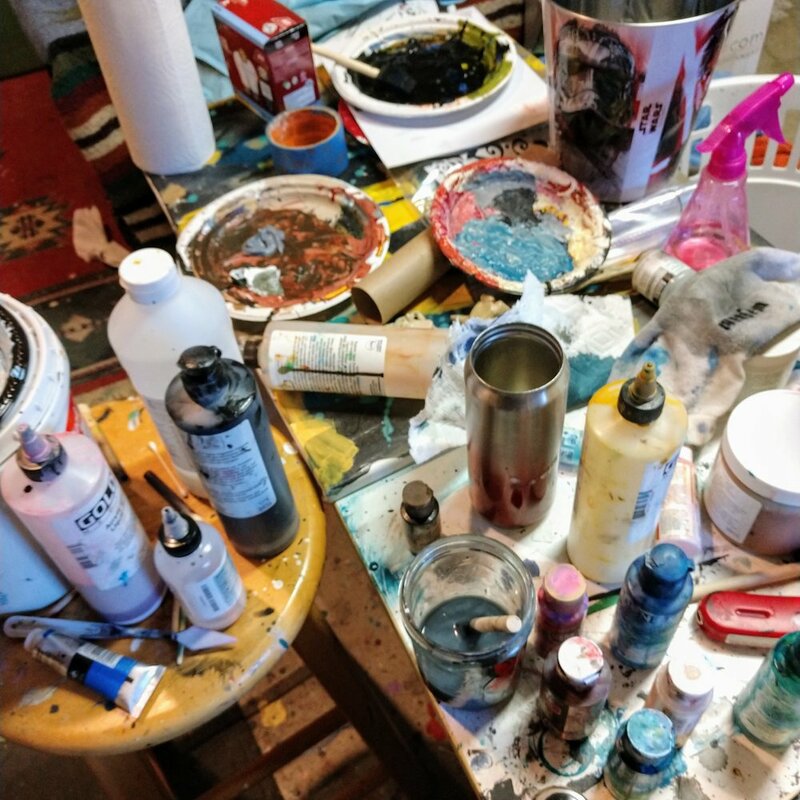 This year I will attempt to clean up my studio. The Storm has landed! It looks great. Pretend You Love Me has found a home. Looks fantastic. Thanks to the buyer. Thanks to everyone who came out to my reception at Solaire on Friday. Had a great time. Saw some old friends and made a couple of new friends. My show at Solaire has opened. Take your eyeballs there and check out the paintings. Solaire is located in the Hotel Paradox. The reception is this Friday, November 10th from 5:30 to 7:00. Come eat, drink, visit, and look at my paintings. A hearty thanks to the buyers. Looks amazing. Mapping the Dreamer Fields. Acrylic on canvas, 24"x24"
The Oswald opening was not without some drama. 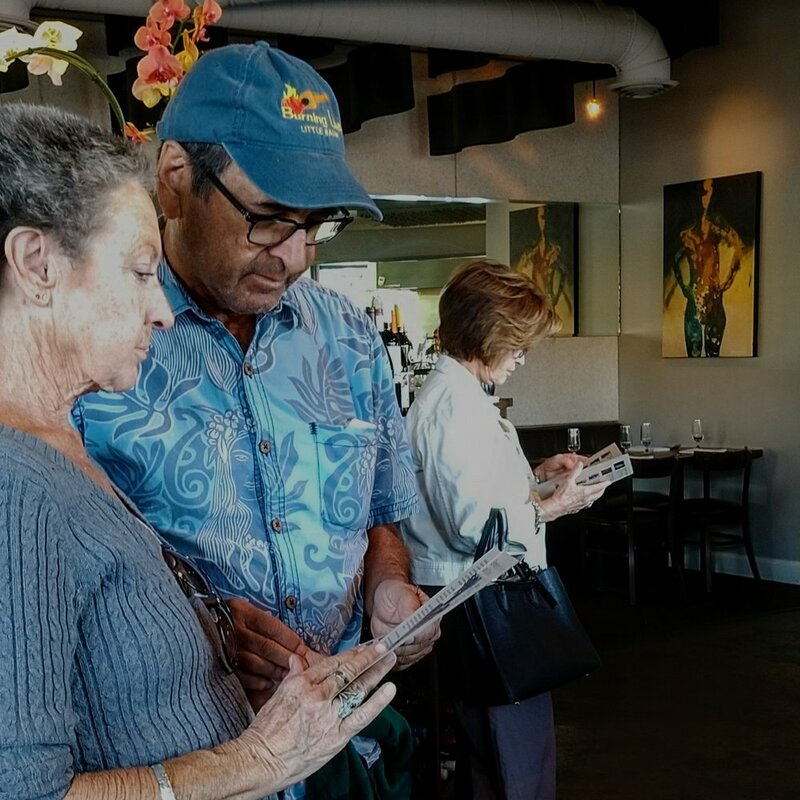 Shortly after I arrived at the reception the owner of the restaurant informed me that Mapping the Dreamer Fields (pictured above) had been stolen the night before. The painting had been hung in the women's restroom. This created quite a buzz at the reception and my feelings were pretty mixed up. Was this an honor? An outrage? 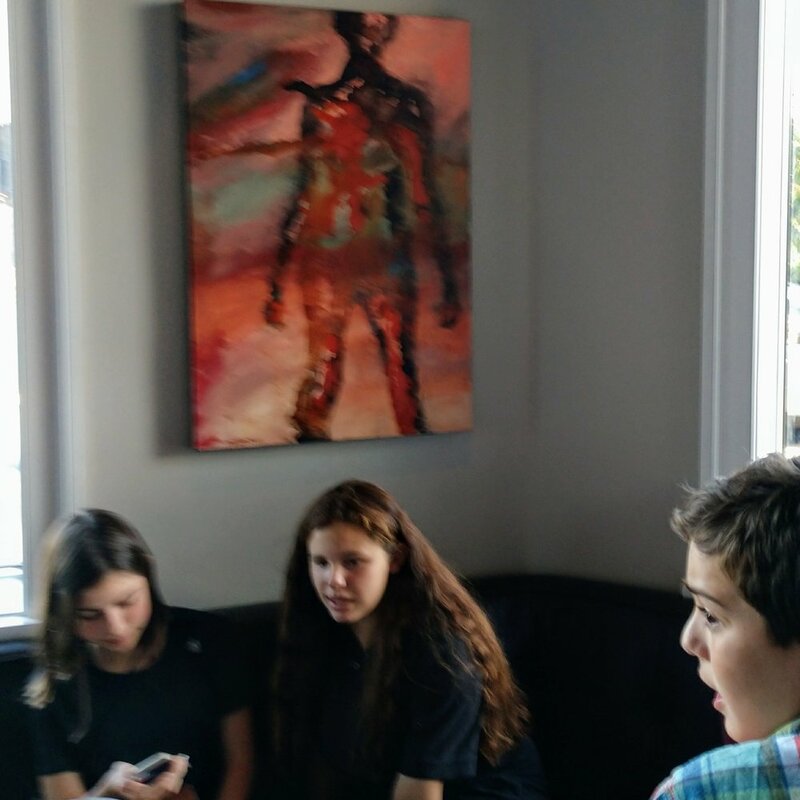 After the reception, I had dinner with friends and family and as we were leaving an employee walked in with the painting. It had been tucked away, behind a curtain, near the rear door of the restaurant. Employees all had been back there, so, it appears the painting did not fit in with the thief's decor and was returned. I had mixed feelings about the theft and mixed feelings about its return. My wife reminded me that one of the reasons the Mona Lisa became so iconic and famous was that it had been stolen and returned. So, on a minuscule level, I guess this is my Mona Lisa. The Oswald staff was professional all the way. 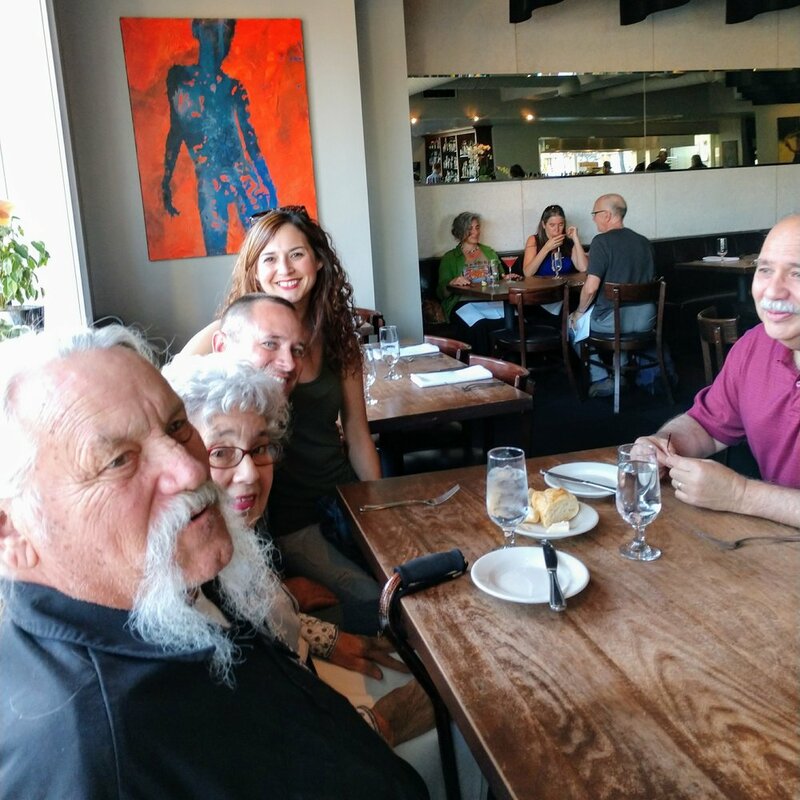 My show was the 104th show at the restaurant and they had never had an incident like this. 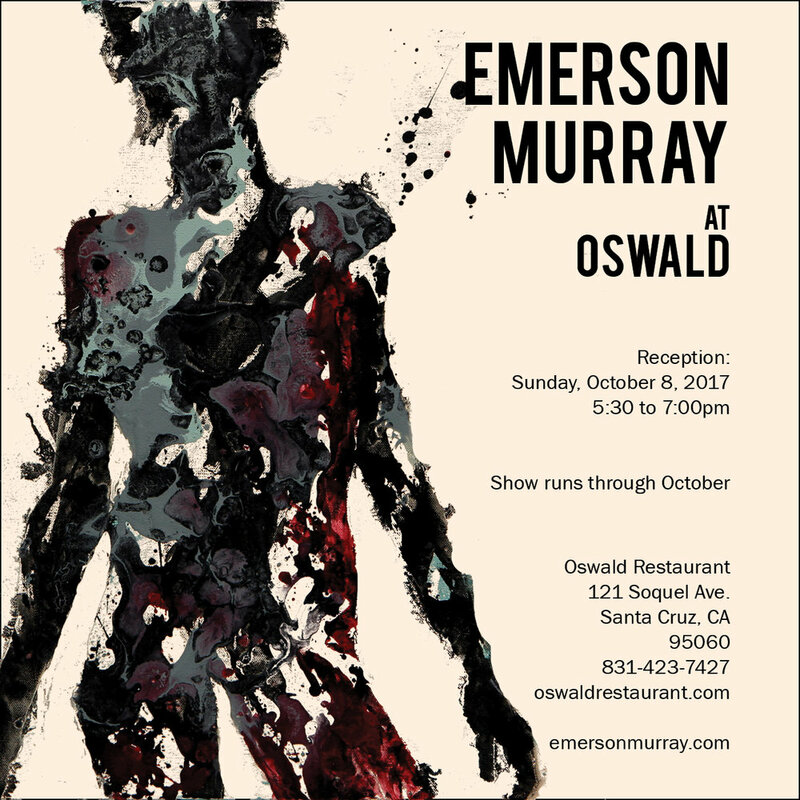 Oswald is one of the best venues in Santa Cruz to show art. AND, it is a fantastic restaurant. I questioned even writing about the theft, but everyone at the reception left with the impression that the painting had been stolen. Please spread the word that the painting was recovered. Thanks! A big THANK YOU to everyone who came out to my Oswald reception last night. We had a large crowd and a lot of fun. The night was not without controversy as one of my paintings had been stolen the night before. But just as we were leaving, the painting mysteriously reappeared in the parking garage next door. I guess it didn't match the thief's decor. Thanks to everyone at Oswald for being so gracious and making me feel like a superstar. Included is a pic with my bebe and I before the show. 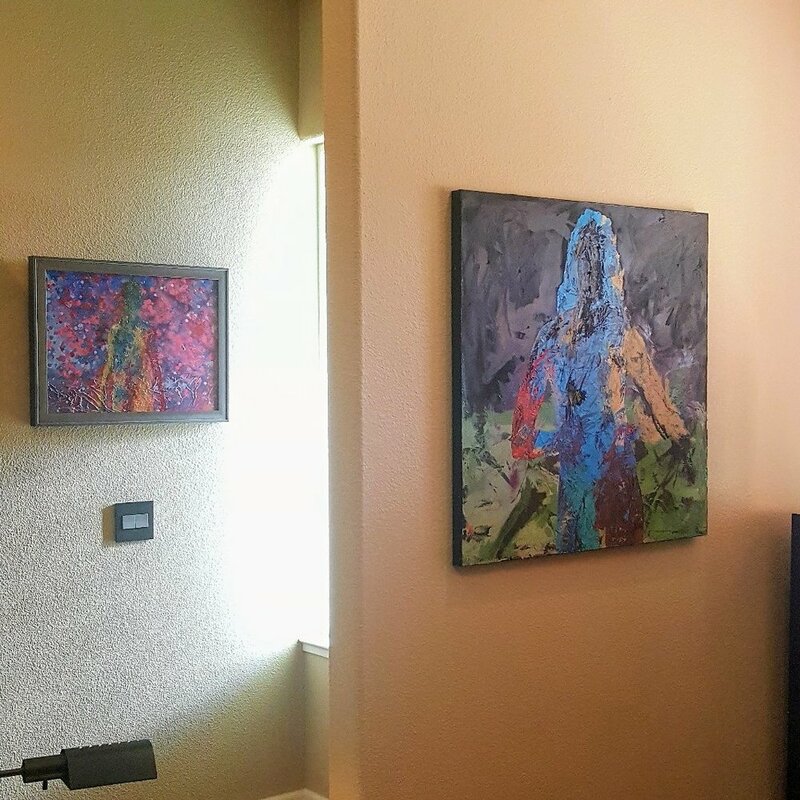 One of the important, little pleasures, of making art is receiving pics of my paintings in their homes. The art pieces on my walls mean a lot to me. They inspire me, make me laugh, make me sad, make me feel. I hope my paintings do the same for their buyers. Thank you to all my friends and buyers. Emerson L. ponders his new painting. Thought I would share the inspiration for the pose in my latest painting. 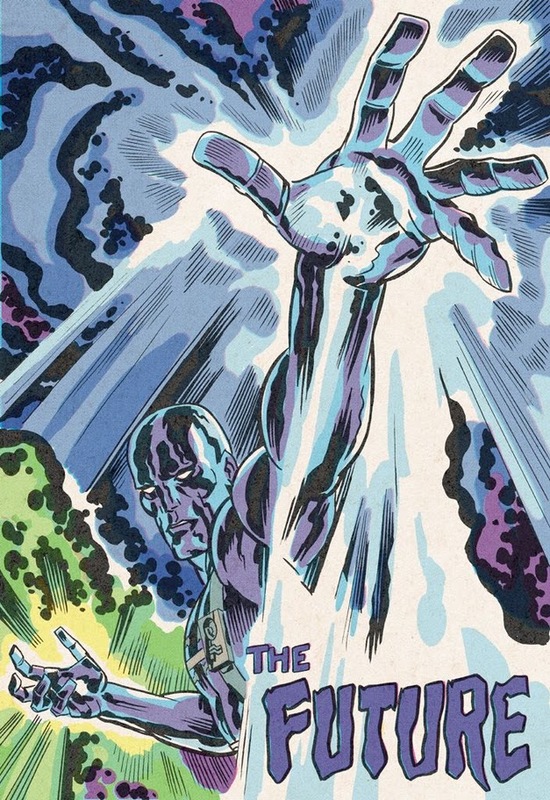 The model emulated the pose from this Jack Kirby illustration I found online. Like so much of Kirby's work, the pose is striking and powerful. This was a small painting, 12x12". Acrylic on wood. Normally, I mask my paintings and go crazy, but the small size made masking impossible for me. The video would have been longer but I was getting frustrated trying to paint with one hand. Also, Atticus was waiting to go on a walk. Find Me. 16x20". Posting while I'm home for lunch with an injured kid (twisted ankle.) Layers and layers of drizzling, dripping, and flicking. The colors in the actual painting are a bit more subtle. Not a perfect pic. Mixing my own acrylic paint tonight. My recent painting, If I Had My Own Way, is all handmade acrylic paint. A Call Before Daylight. Oil on canvas. For sale when it dries. A few close-up and making-of pics of my latest painting. If I Had My Own Way. 24x48. Layers and layers of flicked acrylics. Had a fantastic time in New Orleans but this background was calling me. Felt great to be back in the studio. I practically attacked the canvas. Thing #2 found a perfect spot for our Friday the 13th painting by @vhsgirl. Right next to my painting of Kirby's Dr. Maas and her signed John Carpenter Halloween print. Cool kid. My shrunken head dozes on my @vhsgirl painting! Got both today. Check out VHSGirl's account for more of her amazing work. The shrunken head is from @boutiqueduvampyre which is amazing as well and her daughter was wearing the same Ghost shirt that my daughter has, so she rules the school as well! Went to the New Orleans Museum of Art. Rodan, some old guys, Mildred Thompson, Modigliani, Max Ernst, Diebenkorn, Hofmann, Miro, and Kirchner were all there. There were two Picasso's but I didn't take pics because they pissed me off. I hate it when he painted super thin with crappy strokes that you can see through. Makes me want to elbow drop his peanut looking head. PS Mildred Thompson is my favorite artist of the moment. So, most places in New Orleans seem to have a no photo policy. I had to sneak these pics. But, these are some of my favorite galleries and pieces that I've seen so far. The second pic is a bunch of pieces by @vhsgirl and they are amazing! Wood blocks painted like VHS covers. Guess which one I bought!